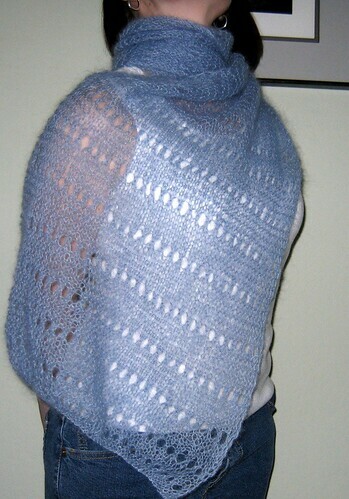 This is a very simple shawl / wide scarf that looks more complicated than it really is. A straight knit with a lace row every so often is perfect for beginners or when you want an easy knit to show off a pretty yarn. Made with mohair or other fine wool it is surprisingly warm. Repeat Lace Row and 10 knitted rows until a little short of desired length. Notes: I am under 5 feet tall so my finished item is about 14 inches wide (35cm) and 55 inches (140cm) long. You might want to adjust to make a wider wrap and increase the length. Hi. Just wanted to thank you for sharing this. It’s beautiful. I’ve been looking for something exactly like this to make for my Mother-in-law for Christmas. It is lovely but looks to be wider than 14 inches.